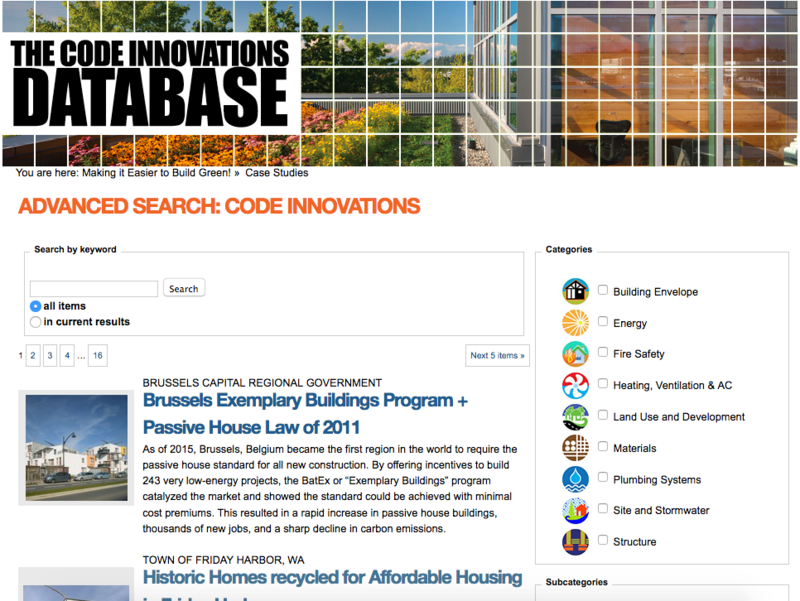 The Code Innovations Database shares small, local successes on an internationally accessible platform. When engineers for the six-story Bullitt Center went to Seattle code officials looking to install composting toilets, success was not assured. Composting toilets don’t follow the letter of the Universal Plumbing Code, and bathrooms with composting toilets aren’t ventilated in the usual way. Yet because of a local ordinance designed to encourage Living Building Challenge certification, the team had almost no trouble getting a permit for this and a number of other novel systems. As projects push the limits of green building technology, they often push the limits of building codes as well—but it all happens quietly in the offices of local code officials. The Code Innovations Database is trying to change that by sharing small, local successes on an internationally accessible platform. The database records successful code variances in the form of searchable case studies. Building professionals and code officials can then find precedent-setting projects and potentially use the same methods to gain approval for similar technologies. A project of the Northwest EcoBuilding Guild, the database currently focuses on jurisdictions in the Pacific Northwest, but the owners are seeking to expand it to a national scope. The case studies cover two types of innovation: projects that have successfully stretched or changed building codes, and policy and code updates that encourage green building. Users can filter by green building attributes (energy, materials, land use, etc.) or can search by keyword to find relevant case studies. Users can submit their own success stories by writing to education@ecobuilding.org. Seattle Bends Rules for "Living Buildings"